I don’t tend to like surprises, but I love them when they involve Social Media. 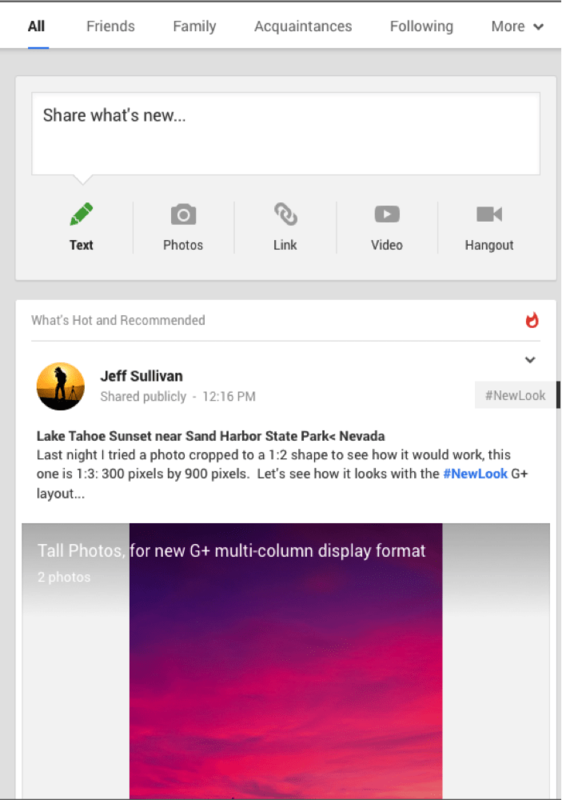 Google+ had a whole new look and feel. While this design change is going to be exciting for many of us, there are some people who will find it a bit daunting – especially if you were just getting comfortable with the previous design. It may seem like right when you were starting to finally feel comfortable with the platform, Google went behind your back and changed everything. But do not fear! It’s really not as bad as it seems. Plus, I’m here to help you understand this new layout and feel just as comfortable with this one as you were getting with the old one – maybe even more so! Let’s start with the dashboard. As you can see, this new layout design will allow you to have better control over your posts and shares. I don’t know about you, but this seems to have a kind of Pinterest feel (I wonder why). 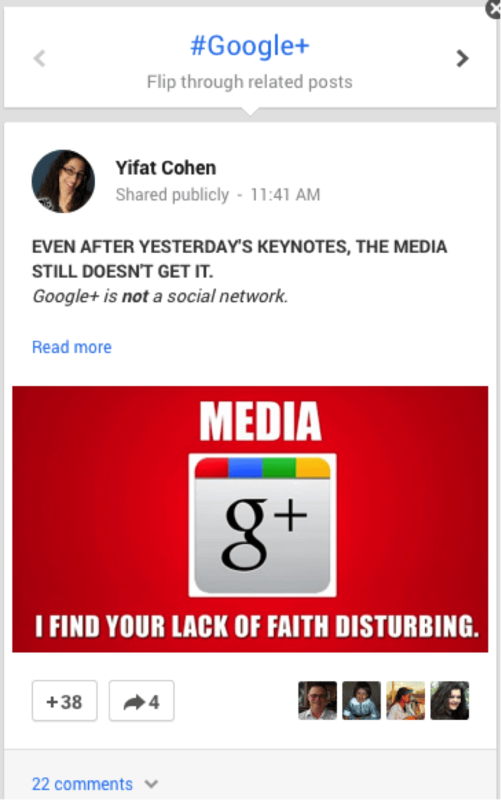 With this new format for your news feed, Google+ is prompting you to share and +1 as much as possible. Want Your Old Layout Back? Welcome to the (Hangout) Party! Another really cool new feature that appears to the right of your dashboard is your Hangout and Chat section, which are now conveniently merged together. Now, that’s neat! 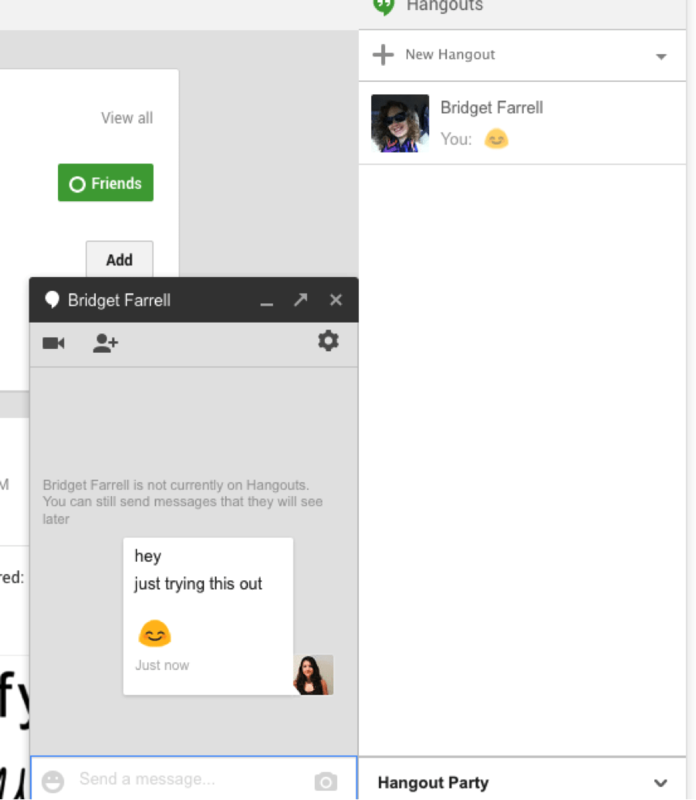 Not only is this new layout extremely user friendly but it also facilitates chatting with multiple users in a “Hangout Party” as Google+ likes to call it. It’s Okay to Wear Socks, There’s No More Static! To the left of your dashboard, you’ll be able to see your toolbar with several features that you may recognize from the previous layout, only that now they are not static, but rather slide open when you hover over “home”. When you view your news feed, you’ll notice that the content posted will stand out. The reason for this is because this particular layout will allow you to view posts as interactive cards. 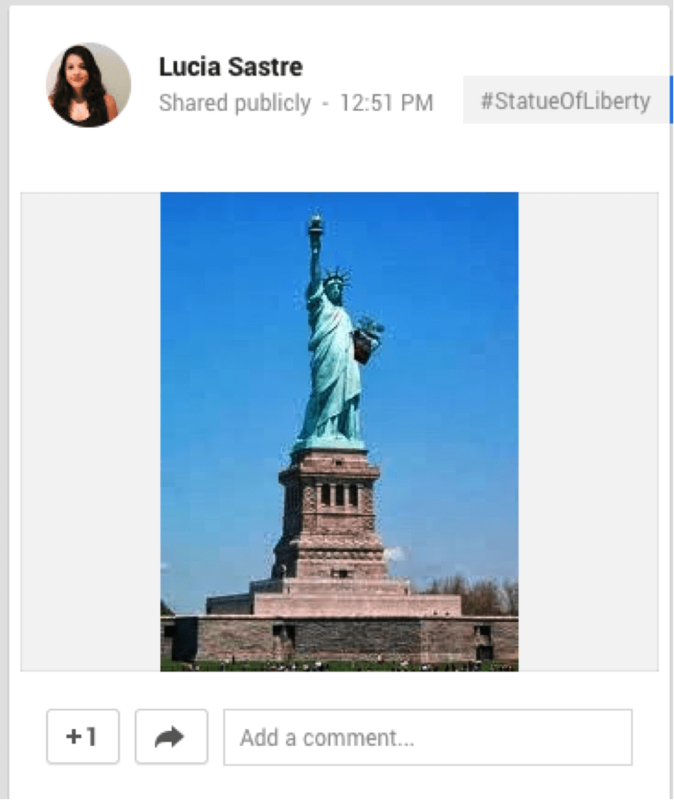 When it comes to posting content, Google+ now automates hash tags according to what’s being shared. For example, if you post an article about new Google+ features, Google+ will automatically create a hash tag called Google+. This is because Google attempts to categorize all the data online for organizational purposes. You may remove this hash tag if you like by simply clicking the X next to it. If you decide to click on the Google+ hash tag, you’ll notice that the card will flip and prompt you to the most relevant content pertaining to that particular hash tag. The cool thing about all these features is that they are mobile friendly as well. If you are big on information hogging, then don’t forget to use your notification feature. This will allow you to receive the posts you want to learn about on your news feed by simply customizing your notification feature. You may turn this on and off, as well as customize how often you would like to receive posts from a particular individual. This feature ultimately facilitates the information gathering process that allows you to learn from the topics you want in an easy and fast manner. That is one of the main benefits Google+ wanted to achieve with their new design. Besides these cool new features, there are other interactive animations that are especially efficient in Google+ mobile apps. One of these includes a bounce when you share someone’s photos or posts. These animations have been designed to help you engage with the news stream. Although it’s a pretty neat feature, it’s hard to tell whether or not it will become bothersome once you’ve done it more than 100 times. Then again, everything has its wrinkles. It appears to me that Google is doing what it knows best, and that is gathering massive amounts of information and categorizing it in order to minimize the search hassles and help you consume as much information as possible. In terms of Google+ re-design, we can see that their new look fits with the design standards of other Google products, including their new font called Robot. This is meant to help you associate Google+ with Google authority and perhaps help you consume more information. 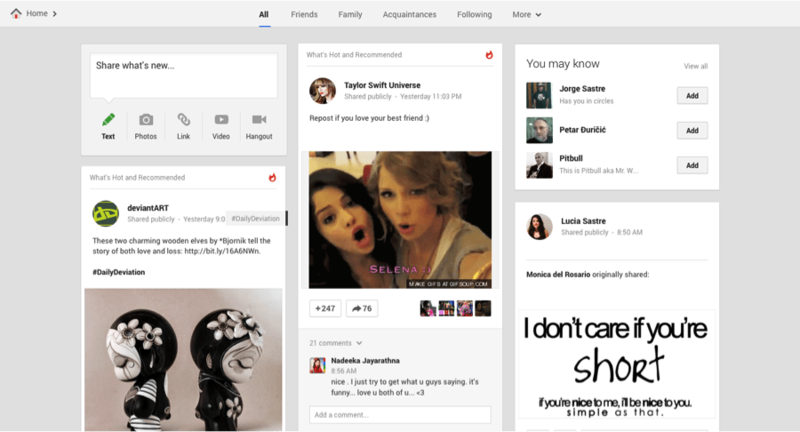 What do you think of the new Google+ layout? Love it or hate it, I want to hear your thoughts, so head on down to the comments section and let me know what you like best or hate the most. If you’re a business struggling to get started on social media or manage your accounts, we can help. Contact us today and tell us the problems you’re having. We can create a social media strategy just for you. The initial consultation is free!